If you run any sort of business, invoicing is probably one of the tasks you spend the most time on. It doesn’t matter if you’re a freelancer, or you’re the CFO of a massive corporation. It’s probably also one of the tasks you dread. Today we’ll run through some invoicing tools to make this less of a chore. Except for a handful of accountancy nerds, nobody gets excited about sitting down to create invoices. Not only is it boring, but the stakes are high. If done badly, you can find your self in all kinds of embarrassing situations. Even worse, you might find yourself out of pocket. What is are Invoicing Tools? This might sound like a stupid question, but bare with me. Of course, at their core, invoicing tools create invoices. At least, that’s always the basic function. However, they’re not all created equal. Since this is a pretty crowded corner of the software market, most invoicing platforms have to target specific niches. That is to say, they put more emphasis on different functions. That means that some invoicing tools are a better fit for specific users. Harvest Free. Time tracking functions. Free version only available for freelancers. FreshBooks $12.95 a month. Read-notifications for invoices. Expensive to add multiple users. Invoicera Free. Suited to scaling. Price based on number of clients. Billiving Free. Multi-lingual support. Extra users incur additional costs. Invoice Ninja $5 a month. High level of customisation. Limited visual options. Blinksale $15 a month. Organisational features. Most expensive invoicing tool. So, even at a cursory glance we can tell each has its ups and downs. The question then, which are appropriate for which users? Let’s take a look at each in a little more detail. Harvest is the first of the invoicing tools we’ll look at together which is has a free version. This, however, is only available for freelancers or solopreneurs. Things get more expensive when multiple users are added into the mix. This is fairly telling of Harvest’s target market. Indeed, of todays’s invoicing tools, it’s definitely the most freelancer friendly. It’s main focus is time tracking. This can be done a number of ways. You can manually stop and start a timer, or input your own timesheet. More impressively, however Harvest also integrates with a number of other platforms, so it’s easy to work your time tracking directly into your workflows. Your invoices are then automatically generated and sent out to your clients. You can also set up automatic reminder emails, and PayPal integration. These are two features which are really great for cutting down the need to chase clients. Every freelancer knows that time doing this is time that could be better spent. Starting from $12.95 per month, FreshBooks is one of the more expensive offerings. It’s maybe also the most well known. It also has some pretty novel features, which make it a good choice for companies of any size, who are willing to splash out a little more. The visuals of the invoices themselves are extremely impressive. FreshBooks’ visual editor makes creating professional looking invoices an absolute breeze. You start with a template, then add your logo and make any changes you want to the colour scheme or font. That way, you can have a slick looking invoice in minutes. On the functional side, there’s plenty to rave about too. I particularly liked the receipt manager, which helps make accounting for expenses that bit easier. Some of my favourite features relate to late payments. You can set up your invoices with read notifications, so you know your client has seen it. FreshBooks can also be configured to automatically apply late payment fees. 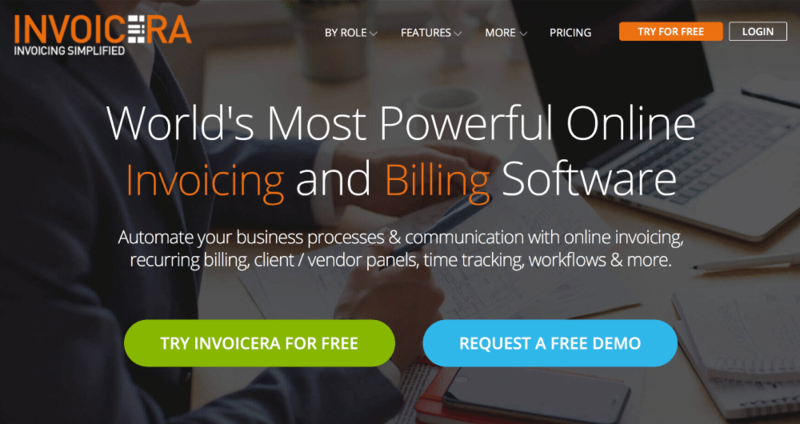 Invoicera is the next of our free invoicing tools. Interestingly their payment structure isn’t based on number of users. It’s calculate on the number of clients. The first three are free, beyond that prices start at $19.95 per month. That fact along could determine whether or not it is a cost effect option for your business. The main selling point of Invoicera is definitely ease of use. Everything is managed from a central dashboards. Here, you can view recent activities, as well as create and schedule future invoices. The dashboard format also offers an up to date view of your financial state. That means you can keep a broad view of your business in the same tool where you create your invoices. 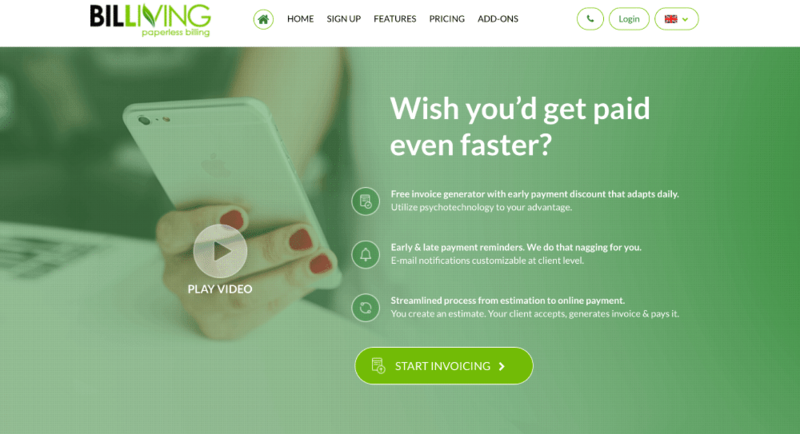 The last of today’s free invoicing tools is Billiving. Even the most expensive plan is still pretty cheap at $10 per month. This doesn’t include the fact that each extra user is an additional $2 per month though. Billiving claim that their product is best for small businesses. I tend to agree, but I’d almost place it as a more appropriate choice for startups. The ease of use mean it’s ideal for non-specialists. There’s some impressive extra features too. Billiving supports multiple currencies and languages, which is great for companies operating across markets. It also allows you to create personalised sub-domains, which is very useful for eCommerce. Starting at $5 per month, Invoice Ninja is another decent all-rounder. While it’s fairly feature packed, what makes it a really interesting option is that it’s totally open source. That means that it’s really easily customisable. The number of payment integrations is really impressive too. You can provide over 40 payments gateways in your invoices. Making it easier to process payments makes your clients more likely to pay out promptly. Free users get access to 4 invoice templates. Premium users can use an additional 10. Customisation is fairly limited, although you can add your own logo. Blinksale is the most expensive of today’s invoicing tools, starting at $15 per month. Interestingly, it’s totally browser based. The benefits of this are twofold. First, it makes things very easy to set up. Secondly you can access it anywhere. There’s also a nice range of invoice and thank-you note templates. These can be integrated with Stripe, to give your clients the ability to easily make card payments, while avoiding the high fees of some other payment platforms. Blinksale also has several features which help to keep you organised. These include push notifications for things like due dates and follow-ups. I think I’ve given you plenty to mull over. As I mentioned already, each of these invoicing tools has distinct advantages and disadvantages. What I hoped to do is draw attention to how some of these might relate to specific users. If I had to pick the stand-out offerings, I’d probably highlight Harvest for freelancers and FreshBooks as an all-rounder. The reason we write these comparisons is because we run lifetime deals of software for our audience. To get access to these deals head over to our homepage and sign up to the email list. You can find more software reviews on the Launch Space blog.